As anticipated, yesterday’s tinderbox of a stage was ignited early on as the general classification leaders took the initiative by the scruff of the neck and saw the likes of Vincenzo Nibali and Esteban Chaves lose time to the day’s winning triumvirate of Alejandro Valverde, Steven Kruijswijk and Ilnur Zakarin. Today’s challenge is likely to be a contrasting affair altogether, pulling focus back to the (remaining) sprinters as they are afforded the seldom opportunity of a sprint finish; assuming the breakaway do not have something else to say. 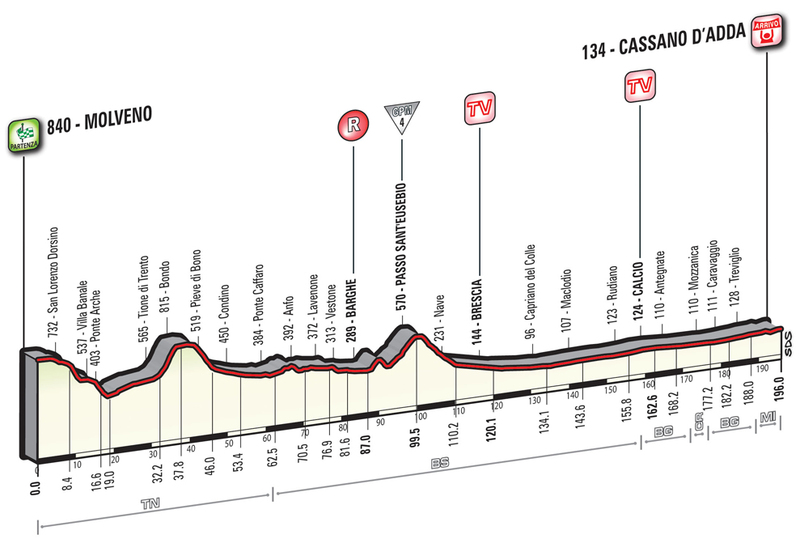 The 196km trip from Molveno to Cassano d’Adda has an extended rolling section to begin with, and if the day’s breakaway is comprised of the right riders, it could prove difficult for Trek-Segafredo and Lampre-Merida to bring it back for a sprint. Giacomo Nizzolo is in the midst of some of his best grand tour form ever at 2016’s Giro d’Italia, though is still yet to secure his maiden win at this level. The Italian has been within touching distance of André Greipel and Marcel Kittel earlier in the race, both of whom have now departed the race (along with Caleb Ewan and Elia Viviani), leaving Nizzolo as the clear favourite for stage honours here in Cassano d’Adda. However, along with his sprinting rivals, Nizzolo has now lost two crucial components in is effective leadout train; Fabian Cancellara and Boy Van Poppel. The result of this should be that Lampre-Merida emerge as the strongest team during the final kilometres, marking Sacha Modolo out as the main man standing between him and grand tour glory. Sacha Modolo possesses a far superior record at this level than his compatriot Nizzolo, yet has not performed at a comparable level to him at this year’s Giro thus far. However, he now finds himself in a stronger position than his rival thanks to a leadout train which has not suffered the same abandonments as Trek-Segafredo. There is a strong likelihood that Modolo will be allowed to lead everyone else through the final corners as a result of his team’s strength, with a greater battle occurring behind as others fight for his wheel. It would be cruel for Nizzolo to leave the Giro once again without a victory, but Modolo certainly ticks all the boxes as the pantomime villain poised to spoil the fairytale. Luka Mezgec will now step up to lead Orica-GreenEDGE in the sprints after the young Caleb Ewan left the race last week and will be a danger to the bigger favourites. Mezgec’s wins often come off the back of a tough day in the saddle, so today does not quite fulfil that requirement, but the attritional nature of a grand tour will compensate for this somewhat. Should the Australian outfit miss the day’s breakaway, it seems obvious they will contribute some riders to bring the escapees back, but their focus upon the safety of Esteban Chaves will limit this to a degree. EDIT – Mezgec has since retired from the race due to a fractured scaphoid. Alexander Porsev has seen his consistent sprinting at the Giro d’Italia up to now attract him little press, yet few have featured so regularly in the spinrts as the Russian thus far. With a greater reduction in the strength of his rival team’s leadout trains by this point of the race, Porsev may find life a little easier with less wheels to negotiate his way to the front, especially given his small sprint support here. The breakaway has the potential to cause real trouble here, as the number of teams truly committed to bringing things back together is essentially limited to Trek-Segafredo and Lampre-Merida. Nicola Boem, Ramunas Navardauskas, Pim Ligthart and Svein Tuft are just some riders who may have exited yesterday’s tough stage in a strong enough condition to challenge here. Posted on May 25, 2016 by Spokenforks	This entry was posted in Giro d'Italia 2016, News and tagged 2016, Alexander Porsev, Giacomo Nizzolo, Giro d'Italia Stage 17 Preview, Katusha, Lampre-Merida, Lotto-Soudal, Luka Mezgec, Nicola Boem, Orica-Greenedge, Pim Ligthart, Ramunas Navardauskas, Sacha Modolo, Spokenforks, Svein Tuft, Trek-Segafredo. Bookmark the permalink.